May you find great value in these inspirational Thomas Fuller Quotes from my large datebase of inspiring quotes and sayings. for every man has need to be forgiven. All commend patience, but none can endure to suffer. married men are the best binders, in the hedge of the commonwealth. of the face can smile while the other is pinched. It is more difficult to praise rightly than to blame. nor be sure of his friend till he is unhappy. The patient is not likely to recover who makes the doctor his heir. Pride will spit in pride's face. but fame relates all, and often more than all. 'Tis not every question that deserves an answer. but in taking away some fire. and then thou wilt easily govern thy wife. Better one's House be too little one day than too big all the Year after. and in this lies the great distinction between great men and little men. is a saint; that boasteth of it, is a devil. With devotion's visage and pious action we do sugar o'er the devil himself. A drinker has a hole under his nose that all his money runs into. 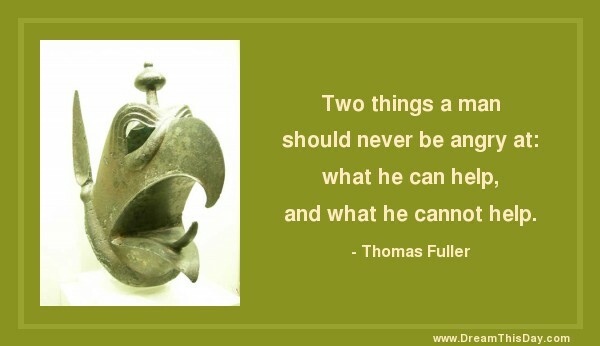 Thank you for visiting these Thomas Fuller Quotes and Sayings - Quotes by Thomas Fuller.